Although they do offer the same basic line of coffee all the time, one could easily buy all their coffee from Trader Joe’s and never get bored because they constantly bring in new (often limited) blends to their stores. 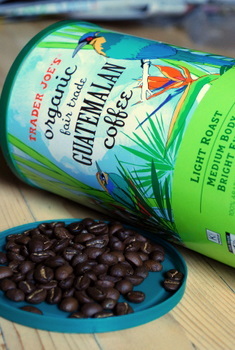 Trader Joe’s Organic Fair Trade Guatemalan Coffee hit shelves recently, and is noteable not just because of its brightly-colored label, but because it is a light roast and a lot of their other recent picks have been much darker. This coffee does have very lightly roasted beans that seem a bit dry when you grind them, leaving a slight powder behind in the grinder. Brewed, the coffee is very smooth and, although light, has a clear chocolatey flavor (it is outstanding for bringing out the flavors in a mocha) with a slightly nutty edge to it. It’s a versatile coffee with a nice, bright flavor, and one that light roast drinkers can enjoy over some of TJ’s darker selections.